Home Florida Springs 2010, Florida Springs Bright and Early at DeLeon Springs! 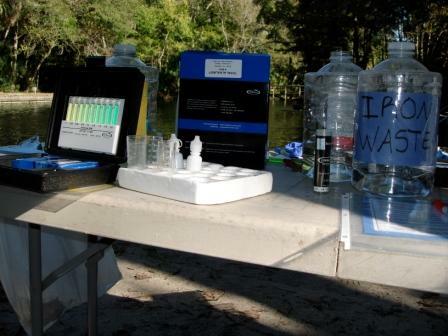 Another gorgeous day for sampling at DeLeon Springs in DeLand, Florida. The team met up early this morning at 7am. 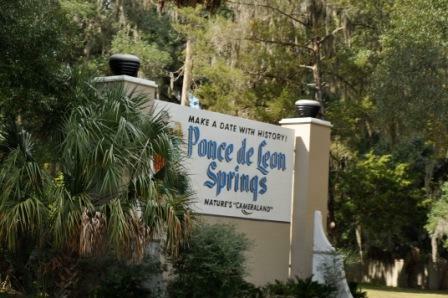 Our mission today was to sample bacterial mats in the caves of DeLeon Spring located in Central Florida’s DeLeon Springs State Park. 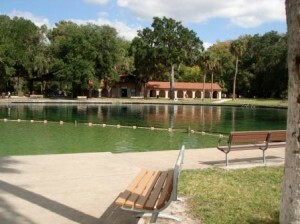 (See Florida Springs Project for more information about DeLeon Springs.) Known from previous sampling, the cave is lined with a variety of orange colored bacterial mats, and we are back to monitor growth since our last sampling and continue to collect water quality data. Aaron Mills and Michael Reiter discussing sampling protocol before the dives. We arrived at the park around 8am. There were low clouds creating a thin layer of fog, and the morning air was a bit chilly, all of which set us up for the perfect Halloween dive. The dive team unpacked the vehicles and prepared their gear while the science and research team set up the surface field analyses. Today was my second day to be the dive supervisor, so I worked closely with the dive team to correctly obtain the necessary data (gas composition, beginning pressures, etc.) to begin the dives. I also made sure that all safety equipment was in place, as well as communicated with and to the scientific team. After a quick run-through on proper sampling techniques, both teams were ready to go. Around 10am, the dive team was in the water, submerging to the cave entrance about 30 feet below the surface. 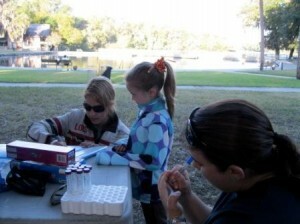 Brittany, Allie, and Betsy prepare sampling bottles and centrifuge tubes. When we first arrived at the springs, not too many visitors were there. As we waited for the divers to return to the surface with the sampled bacteria, more people started to arrive. It was still abnormally quiet compared to a normal Sunday, most likely due to the Halloween weekend. The temperature began to warm up, turning into a beautiful day. About an hour and a half after their descent, the divers had finished sampling and had reached the surface. They handed off the collected material to the science team, sending them off to work. The science team fixed the bacteria and prepared it for shipment back to Dr. Franklin’s lab and ran many on-site tests, including ammonia, sulfide, alkalinity, etc., with the water collected from each station. Water quality test kits waiting for the divers to return with samples. 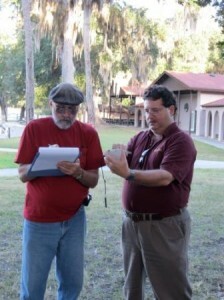 We were joined in the field today by Dr. Michael Reiter, Ph.D., of Bethune-Cookman University. He is an associate professor of environmental science and a colleague of Dr. Aaron Mills. It was a pleasure to have him visiting! After smooth and productive surface and underwater missions, we were able to finish around noon. Our team then ended the day by heading over to DeLeon Springs’ famous restaurant, The Old Spanish Sugar Mill Grill & Griddle House, for an amazing pancake brunch and debriefing. As always, many thanks to the staff at DeLeon Springs State Park, the biologists at District 3, and to the Florida Park Service for continued support of this research. Questions or comments for the Trilobite?